I’d love to get more consecutive sleep at night, but I’m impressed with how well my body has adjusted. With Maximus I remember feeling sleep deprived for what seemed like forever. This time around it didn’t last longer than that first week. I still wake up feeling really tired and the early morning feedings are the worst. That 3 or 4 am wake-up is really tough. It takes me a while to wake up to Quinten’s cries and I often find myself with long blinks and burning eyes once we sit down. I’ve been known to start putting myself to sleep with the rhythm of the back patting. When you’re up every two hours, in the middle of the night, there’s not much to do that is engaging. No one else is on Facebook, Twitter, or Instagram. I’ve been known to send text messages during the middle of the night or respond to emails. If you’ve got blog suggestions or activities for the middle of the night, send them my way! For the next feeding, I want to hit the snooze button. Except, you can’t do that with a hungry newborn. 🙂 As hard as those early morning feedings are, I haven’t been smart enough to go to bed early. I value my time with Bryan too much to go to bed when Maximus does. If I didn’t stay up, my marriage would suffer a lot during the next few months. It’s the little piece of normal that we can hold on to. I’m not sure why this time feels easier, because Quinten is definitely not sleeping as well as newborn Maximus ever did. I can only believe that it’s those superhuman mommy powers that you get. I thought I already had them. It appears that you get more each time you have a baby! I’ll give Quinten a few more weeks until I start getting desperate for sleep. He’s still an itty, bitty little guy who wears newborn clothes. I can’t fault him for having a little stomach that doesn’t hold much or for burning through the milk. But, if he wants to start sleeping a little bit more, I’ll consider giving him the spot of favorite child. 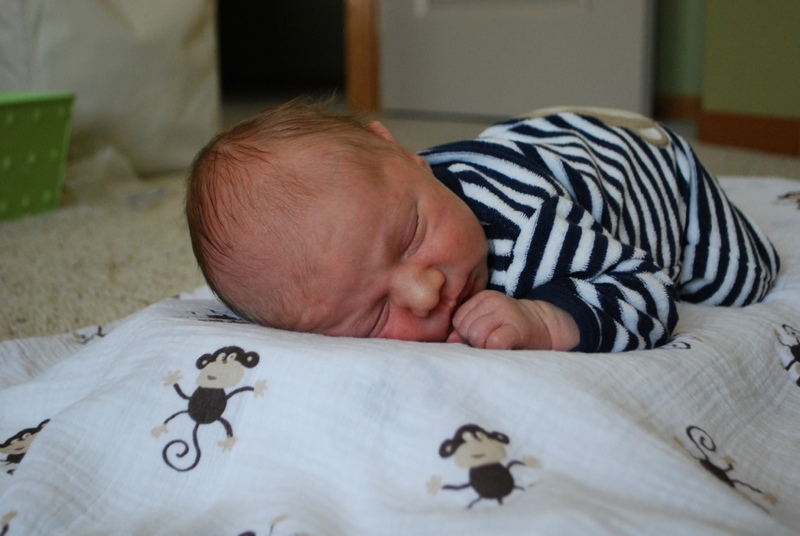 This entry was posted in Baby, Motherhood, Newborn, Parenthood, Quinten and tagged Newborn sleep schedules, sleeping through the night by Kyley Leger. Bookmark the permalink. Oh you gotta love the baby sleep question from others. Oftentimes, mine were followed by questions about “how much I was feeding him” especially from those who didn’t breastfeed. It is amazing how your body adjusts to the feeding routine, isn’t it?! I found the nights Brant began sleeping more to be the hardest since I would lie there awake waiting for the next feed! You’re doing a great job, Kyley!